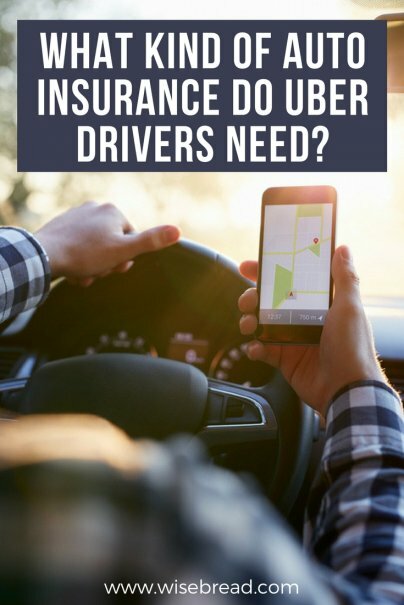 Home » Personal Finance » Cars and Transportation » What Kind of Auto Insurance Do Uber Drivers Need? But that doesn't mean this side hustle comes without risks. Unlike other avenues to earning extra money, like freelance writing or picking up a traditional part-time job, driving people around in your car comes with real-life financial implications if you get into a crash. So what type of insurance do you need to drive for Uber or Lyft? Generally speaking, your personal auto insurance policy won't cover you if you get into an accident while you're driving for Uber or Lyft. In fact, your auto insurer may be inclined to drop you from your policy if they find you haven't disclosed that you're driving for a ride-share service, notes NerdWallet. Ride-share companies have initiated their own forms of insurance to cover drivers when their personal policies fail to provide coverage. That means it's secondary coverage — you'll first have to file a claim with your own insurance. And Uber's insurance comes with a $1,000 deductible, while Lyft's deductible is $2,500. But it's better than nothing. Coverage levels depend on where you are in the ride-sharing process. If you drive for Uber, for example, you have different levels of coverage when you're waiting for a call, when you're on your way to pick up a rider, and when you have a rider in your automobile. When your app is turned on and you're waiting for a ride request, you are covered by Uber for your liability to a third party if you're in an accident and at fault. Coverage is at least $50,000 in injury liability per person with $100,000 in total liability per accident. You also get $25,000 in property damage liability per accident, notes Uber. This does not include comprehensive/collision coverage or coverage for damages caused by uninsured motorists, however. At this point, notes Uber, you're covered for three things: your liability to a third party for damages or injuries up to $1 million, any injuries caused by an underinsured/uninsured motorist, and collision and comprehensive coverage if you also have this coverage on your personal auto insurance policy. Underinsured and uninsured motorist bodily injury coverage covers "any occupant of your vehicle in case of an accident where another party is at fault but does not have insurance or is underinsured," notes Uber. Hit and run accidents are also covered, and the total amount of coverage for bodily injury is once again set at $1 million. The collision and comprehensive coverage offered during this period kicks in whether an accident is your fault or not and is limited to the cash value of your vehicle. A $1,000 deductible comes into play if you plan to use this coverage. You have the same type of coverage when carrying a passenger as you do when you're on your way to pick them up. In addition, however, the rider in your car is also covered. Of course, when you're not driving for Uber and you're using your car for personal use, none of this coverage comes into play. During these times, you'll rely on your personal auto insurance policy for coverage in the event of an accident or injury. Lyft liability coverage works similarly in that it's offered in different tiers based on where you are in the ride-share process. Coverage limits vary slightly, however, as do the types of coverage offered. Make sure you understand what your ride-share company's insurance policy offers and applicable coverage limits before you rely on it to cover your ride-share driving business. There are times during the ride-sharing process when your company's insurance may not be enough. For instance, Uber's insurance does not include comprehensive/collision coverage or coverage for damages caused by uninsured motorists while you're waiting for a ride request. You may also decide you want higher coverage limits than your company offers. In those cases, consider buying separate insurance to fill in your coverage gaps. Insurance companies such as Allstate, Farmers, and Geico have begun offering individual ride-share policies that cover drivers for services such as Uber or Lyft while they're on the job, but these policies aren't available in all states. If you can't buy ride-share insurance in your state, another option is commercial auto insurance, but unfortunately, commercial policies are often prohibitively expensive ($3,000-$5,000, according to the Money magazine website) for Uber or Lyft drivers trying to turn a profit. If you live in a state where ride-share coverage is offered, buying this type of coverage — or adding it to your personal policy — is probably your best bet. Fortunately, auto insurance for ride-sharing isn't overly expensive (typically $6-$20 a month). Geico Insurance, for example, offers ride-share coverage in most states (AL, AZ, AR, CT, CO, DE, DC, FL, GA, ID, IL, IN, IA, KS, LA, ME, MD, MN, MS, MO, MT, NE, NM, ND, OH, OK, OR, PA, RI, SC, SD, TN, TX, VT, VA, WA, WV, WI, and WY) and can cost as little as an extra $150 per year on top of your personal auto policy, according to NerdWallet.